This month, we honor Latino heroes, veterans who served in the armed forces and came home, often to face difficult readjustment. My own father was wounded in Korea, was awarded a Purple Heart and, finally after much prodding from his children, sought treatment for PTSD during his late '60s. He is now 82. I am extremely proud of him for his bravery and for making it back from what he describes as the worst nightmare anyone should ever have to bear. Even as children, we were not allowed to use or play with fireworks on New Year's Eve or the Fourth of July because the sounds made him uncomfortable and reminded him of the hell that was war. He saw terrible things as an 18-year-old enlisted man, things he has been very reluctant to describe. Every year, I call him on Veterans Day. This year, he said not to wish him a happy Veteran's Day but to instead wish him luck with a surgical procedure he underwent yesterday to replace two stents in his heart. Here in Los Angeles, we would also like to remember and honor those like Eugene A. Obregón, a Marine who gave his life to save a friend. Raised in Boyle Heights, he fought in Korea and was posthumously awarded the Congressional Medal of Honor for his sacrifice. Our cover features his portrait. And as such we would like to call upon our elected officials to consider placing a historic plaque in his honor at the East LA park that bears his name. 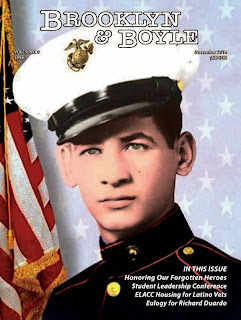 We celebrate, as well, the legacy of Guy Gabaldón, another son of LA's Eastside who went to Japan as a Marine during WWII and single-handedly captured 1,500 enemy troops and civilians. A new housing development created specifically for senior Latino veterans by East LA Community Corporation in a partnership with Co-developer New Directions for Veterans on Beswick St. is named in his memory. Unfortunately, Gabaldón was not awarded the Medal of Honor for his intrepid bravery. While he was awarded the Navy Cross, the nation's second highest military service award, many feel that he deserved, like Sergeant Alvin C. York, who as the leader of a small band of US servicemen, was able to capture 132 German soldiers, to have been recognized with the the Medal of Honor. Our friend and mentor Ignacio Gómez was commissioned to create a clay bust of Gabaldón, and the story will appear in our pages as well. We are proud, in addition, to feature a moving report on the renewal and re-launch of the Chicano Youth Leadership Conference by Thomas Varela, who was a first-hand witness, during his own youth, to the impact and legacy of walk-out leader Sal Castro, an educator whose work steered so many young people who have gone on to become prominent leaders in government, industry and the arts since those heady days of the early Chicano movement. The serialized novel by Claude Martinez, a work in progress tentatively titled HORSES NOT ELEPHANTS, continues to follow the exploits of fictional 1940s Boyle Heights private investigator Tony Varela. In this issue we add another chapter to the forthcoming detective novel. We also, pay tribute Richard Duardo, a maverick artist who passed unexpectedly this week. Known as the Warhol of the West, he was the founder Modern Multiples, a fine art printing studio where he reproduced silkscreen images from the most prominent artists of our time, in addition to creating his own original works. We were fortunate to have had his help on our August 2013 issue in a collaboration with Antonio Pelayo. I believe our interview with him may have been the last published feature story on him and his significant contributions to art in Los Angeles. As always, we invite you to support independent journalism that focuses on the communities which comprise the greater East Side. Your ad saluting our Latino veterans is a perfect way to help us all remember that their sacrifices and service will not go unheralded or forgotten. Your support is invaluable and helps us continue to highlight the beauty and history and heritage that, we as residents, small business owners, and stakeholders in the Greater East Side, who live and work in communities like El Sereno, Lincoln Heights, Highland Park, Eagle Rock, Boyle Heights and beyond, are heirs to.